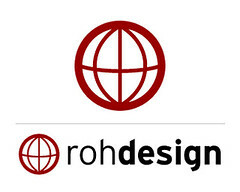 rohdesign.com 10 is years old! Wow, 10 years! Time has passed qucikly since registering rohdesign.com in 1997. So much has changed. When I first registered the domain, I was using Adobe PageMill to build my sites, fighting with layout quirks and strange code that seemed to appear when layouts got a bit too complex. What painful days they were. I had a "Home Page" back then, and I was migrating from a tiny bit of space on AOL's servers, provided as a subscriber. I'd run into limitations with the space, was struggling with PageMill and it was time to take the next step. I was playing with BBEdit by then, learning how HTML code worked, how to create fast-loading images, exploring FTP posting to my new space with Anarchie. 1997 was also the year I seriously considered joining Matt Henderson in his new company ExpoNet, which later became MakaluMedia, and visited Germany for the 3rd time, to attend the wedding of my friends Martin and Thea. It's wild to see how far the web has come since 1997, and how I and my friends have changed in 10 years. In some ways I could never have imagined how different 2007 would look, while in other ways, how many things have remained the same. Congratulations Mike! What a great 10 years of Rohdesign. Congratulatons Mike! 10 years is a long time to keep a site going single-handed -- no mean feat! Wow Mike, 10 years of fun here at Rohdesign! Very nifty look back. The furthest I could find going back in the archives was when you said you were engaged to Gail. Small change since then, huh? Nice "landing page" too. Here's to at least 10 more years of great design, great sketches, and great thinking! Wow, ten years! What a great achievement. Congratulations, Mike. Hey guys, thanks so much for your kind words! Hard to believe 10 years has gone by... on to the next 10! Congrats and more decades of pixel-pushing to come! Thanks for the kind words Neil! !